The State of Big Data and Data Science in Japan | What's The Big Data? ← 2015 Marketing Technology Landscape (Infographic)–1,876 Companies! 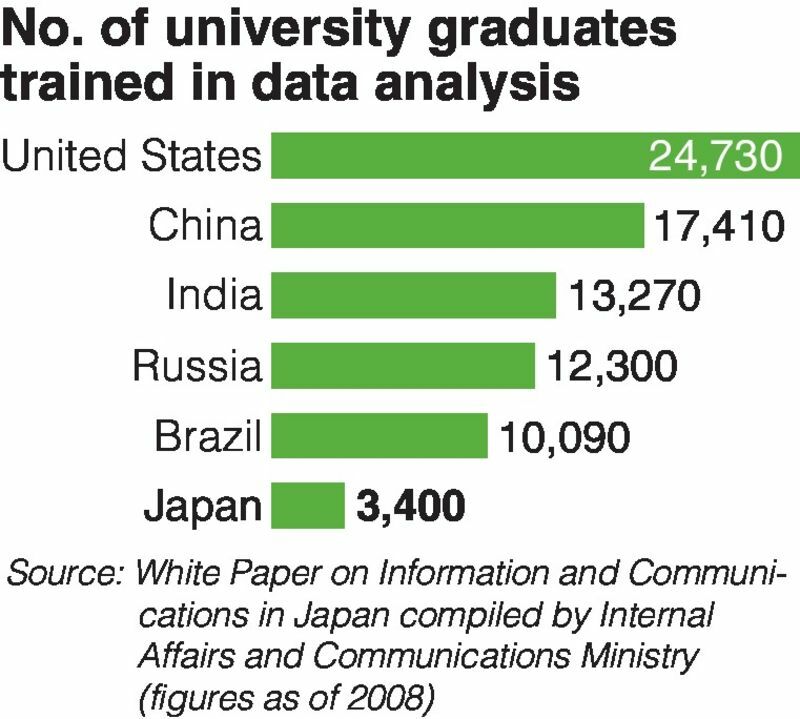 Compared to other countries, Japan has been weak in the field of so-called big data. The Internal Affairs and Communications Ministry plans to launch a free online course on basic data science targeting corporate workers and others, beginning in the middle of March. Professors from the University of Tokyo and others will teach the course, which will focus on giving students a basic understanding of analysis, including how to view and understand data. A video nearly 10 minutes long will be shown four to seven times a week, and quizzes as well as final exams will be taken using laptops, smartphones or other devices. The “office for considering the development of data scientists,” launched by 10 companies and organizations, including IT companies NTT Data Corp. and Nihon Unisys Ltd., established a system in June 2014 to clarify the skill and knowledge required for five different levels, such as “beginners” and “instructors.” This system is then applied to training programs provided in each company. In addition, the Japan DataScientist Society, created by 30 companies and groups including major advertising agency Dentsu Inc. and major online search company Yahoo Japan Corp., publicly announced a similar system in December 2014. However, these activities fail to follow a common path. According to a survey conducted by the Japan Users Association of Information Systems, only slightly more than 8 percent of companies currently utilize big data in their systems (including those in the process of doing so). A major factor contributing to this is that Japanese students of universities and other educational institutions have few opportunities to learn statistics, especially those in the arts and humanities fields. This entry was posted in Big Data Analytics, Data Science. Bookmark the permalink. By these metrics, Japan doesn’t look nearly as bad. Russia looks phenomenal. Still – your point is well taken in that 3,400 data scientists simply isn’t that many for such a large, technologically advanced economy.